The Winter of Discontent (WoD) has not had a good press – either from the right or, less predictably, from the left. The most recent diatribe against this historic wave of struggle comes in a relatively recent publication whose author claims that “The Winter of Discontent marked the democratisation of greed…It was like the spirit of the Blitz in reverse”. A former Labour minister’s comment on the WoD that “it was as though every separate group in the country had no feeling and no sense of community, but was simply out to get for itself what it could” is used to illustrate “the callous spirit which characterise[d] the disputes”. This moralistic tone is sustained even by the openly revolutionary Paul Foot, who describes the strikes as “bloody-minded expressions of revenge and self-interest…”. The sense of sniffy distaste for what is seen as unacceptably “economistic” activity is reproduced in the argument by another left-wing writer, John Kelly, that “the strike wave [was] an example of an almost purely economistic and defensive militancy”. Poor old WoD; it just doesn’t come up to scratch. So what could be the explanation of the Winter’s lasting fame, its sustained role as a symbol of everything that the ruling class loves to hate? 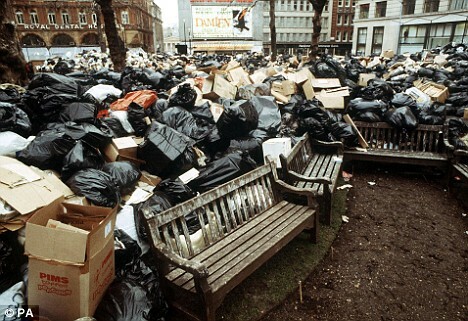 Readers may remember photos of the notorious piles of rubbish used in Tory election posters of the 1990s; even today, the WoD is routinely invoked to raise a spectre of industrial struggle that must, of course, never again be seen. 1978-9 must have done something to rile the ruling class. The Winter of Discontent was the longest and most comprehensive strike wave since 1926, with nearly 30 million working days lost embracing more than 4,500 industrial disputes. However, as suggested above, its analysis has always been riddled by mystifications and misconceptions. One such, very common, is that the WoD was a public sector strike – an assumption bolstered by the various urban near-myths of the dead being left unburied, rubbish piling up in the streets, etc. While these are not untrue, they are exaggerated – and in any case ignore the class basis for such supposedly “selfish” acts. The focus on public sector workers also ignores the fact that this was originally a private sector strike wave. As such, the focus on action by relatively low-paid public sector workers draws attention away from the roots of the strike wave in the determination of the 1974-79 Labour government to restore “economic stability” on the backs of the whole working class through years of (initially) union-backed pay restraint. As shown below, it was this, and not the need to curb “trade union power”, which let in Thatcher. By late 1978, British workers had already endured over four years of both voluntary and statutory incomes policy. Working-class incomes, which had risen in real terms during the late 1960s and early ’70s, began to see the beginning of the end of this improvement; statistics show that average earnings have never, despite ups and downs, returned to their peak levels in 1973. What began the decline? The British labour movement’s devotion to corporatist approaches to combating the evils of capitalism, expressed in this case through the “Social Contract” introduced as part of Labour’s early 1974 election package. While the Contract, immediately and accurately rechristianed the “Social Con-Trick”, contained impressive reforms such as price curbs, pension increases and pro-trade union legislation (yes, that kind does exist) this was on offer from the first only in return for what was at first widely promoted as “voluntary” pay restraint. It was hardly in accord with the times. Labour had come to office “in the wake of a tremendous wave of militant action…”: the new government could now “contain militancy only by running before it”. In part at least, the action expressed understandable outrage at the fact that Labour had inexplicably retained Heath’s “Phase Three” wage freeze, resentment over which triggered a wave of strikes by nurses, BBC staff, GE factory workers and many more. It was not until that supreme architect of left social-democracy, Jack Jones, blessed the Social Contract with the sacrament of the flat-rate £6 limit, prompting a chorus of praise for “equality of sacrifice” from the likes of Tony Benn and Barbara Castle, that the gut-level militancy of the early Social Contract years turned into some semblance of acceptance. Trade unionists bit the bullet, accepted their £6 increase across the board, and gave class struggle a breathing space. For almost a year after August 1975, when the policy was introduced, workers withheld their power; strikes fell to their lowest levels in a decade. It didn’t last, perhaps because the “reward” workers received for their year of sacrifice was to be – more pay restraint. When the government insisted on imposing a year-long 5% pay limit in mid 1976, the reaction was not long in coming. In early 1977 a strike by British Leyland toolmakers pointed to the increasing discontent of relatively “privileged” workers; not long afterwards, steel industry electricians, seafarers and Heathrow Airport workers were also on strike. The unrest was not unconnected to the fact that prices were now rising by 15 per cent and the purchasing power of the average worker had fallen by 7 per cent in the past two years. By the autumn, firefighters and power workers were on strike, and a hysterical flood of headlines – ‘Callaghan Warns of Winter Strikes’; ‘Lights Stay Off’; ‘Blackout Threat to Kidney Patients’ – gave some indication of what was to come. The mass of workers had clearly been prepared to continue with some notion of ‘equality of sacrifice’ to aid the survival of a Labour government – but only as long as it seemed to make any sense. And after mid 1976, it clearly was not. By late 1976 and early 1977, working-class militancy had burst from its restraints in a resurgence of resistance, and a legacy of bitterness, which culminated in the 1978–79 ‘Winter of Discontent’. The WoD, then, hardly fell out of a clear blue sky; rather, it was the culmination of a long series of strikes and struggles against drastic attacks on workers’ standards of living. Nor does its launch sustain the misconception that it was only weak and/or low-paid workers who took part. The first in the unbroken chain of disputes from late 1978 to mid 1979 was a 9-week strike over pay by Ford car workers which “drove a coach and horses” through Callaghan’s incomes policy with a 17% settlement. The “speedy and unprecedented degree of external support Ford workers received from the outset” was attributed by a convenor to widespread resentment of the pay policy. The ‘Ford effect’ was felt in a wave of strikes. Workers at British Oxygen won an 8% rise in October; 26,000 bakery workers, novices to industrial action, walked out in November and gained 14%. By December, oil tanker drivers from Esso, Shell and Texaco had begun strikes and overtime bans, while in early 1979 lorry drivers used flying pickets to spread their strike throughout the country. As the lorry drivers departed the industrial stage, however, on came the public sector workers in whose name the Winter of Discontent is normally commemorated. On 22 January a one-day strike brought out over a million public sector workers; from this time on a variety of groups began coming out on strike in pursuit of their own pay claims. School caretakers struck at the beginning of February, supported in many cases by teachers. Water workers broke through the pay code at the end of February with a 16% increase; on 23 February, civil service unions began national action for a substantial claim. The public workers’ struggle continued to stampede through almost every sector; picket lines appeared in front of hospitals, ambulance stations, refuse depots, schools, colleges and a host of other workplaces. The media barrage is well-known, with “Rats on the Rampage” a typical comment. Yet rather than coming to the strikers’ defence against this ideological barrage, much of the labour movement leadership seemed equally horrified by the sight of uncollected rubbish and other reminders of their members’ indispensability. TUC leader Len Murray was ‘near to despair: this was not trade unionism, this was “syndicalism”. Yet stentorian condemnations did nothing to stem the quasi-revolutionary dynamic. Not only ‘syndicalism’, but elements of dual power began to characterize the dispute: ‘Within a short time strike committees were deciding what moved in and out of many of the ports and factories… In some cases strike committees controlled the public services of whole cities’ . Thatcher herself records in her memoirs that ‘the Labour government had handed over the running of the country to local committees of trade unionists’; her fellow Tory James Prior complained that Britain was now being run by ‘little Soviets’ – local strike committees of lorry drivers, train drivers and other public sector groups beginning to come into the strike movement. Paul Foot’s account affirms the dynamic: “I still recall a sense of wonder and admiration at the way in which the transport drivers of Hull took control of their industry and ran it…in the best interests of the community. The ability – and the yearning – for democratic control was there in abundance”. As so often in disputes large and small, the action mobilised and built working-class participation and solidarity. Journalists reported that during their six-week strike “The impressive thing was how people who had never been on strike before manned the picket lines…they were totally at home with it, they accepted it. What comradeship there was!” FBU members turned up to the journalists’ picket lines with braziers, while pallets of fuel “fell out of the back” of a Royal Mail pantechnicon. Hardly the selfish sectionalism so disparaged by critics of the Winter. Yet the outcome of this mobilisation, this solidarity, was not the triumph of the ‘little Soviets’, but victory for the emissaries of neo-liberalism. On 3 May 1979, Labour surrendered to Thatcher and all that she stood for. This victory was by no means a foregone conclusion. During the election campaign itself, opinion polls varied sharply; two days before polling day, Labour was ahead 0.7 per cent. Yet the Tories won by 7 per cent, more than enough to authorize Thatcher’s mission to destroy social democracy. The conventional explanation for the loss was the electorate’s disgust with “trade union power” as symbolized in the industrial chaos of the Winter of Discontent. Yet the undoubted “unpopularity” of the strikes only accounted for about 1.5 to 2 per cent of the swing; the Tories’ policies on industrial relations were not even at the top of voters’ agendas. Nevertheless, almost the entire labour movement leadership took it for granted that it was “the unions” who had let in Thatcher. The question of what, or who, was lumped together in that formulation was not considered, any more than was the question of who held the “trade union power” she promised to vanquish. There was indeed a form of power in the land during the Winter of Discontent – workers’ power. It was shown only embryonically, but it was based not on ‘greed’, not on the Satanic motives with which the press embellished their tales of evil, but on the usual reasons – attacks by capital on workers’ lives which go beyond the bounds of the tolerable. As one post-mortem pointed out, those who blamed Labour’s defeat on ‘union intransigence’ might be hard put to it to explain “what it was that turned the social contracting trade union saints of 1975-78 into the demonic fiends about whom we read in the Daily Mail of last winter”. Those ‘demonic fiends’ did the only things that workers in struggle can do – they struck, they picketed, they stopped the movement of goods, they disrupted services. In that sense, these prosaic struggles of tanker drivers, gravediggers and dustmen also displayed the only power that workers can have; they withdrew their labour, with a force and to an extent that seriously challenged the organisation and structure of society. What they did not do was to display ‘trade union power’ in the monolithic, dictatorial way which the press, aided by politicians of right and left, sought to depict it. Like all upsurges of struggle, the Winter of Discontent was raw, imperfect, lacking in ideal politics and strategy. Yet what its critics fail to recognise is that this is the character of grass-roots worker struggle in all its “spontaneous” and grassroots glory. The potential indisputably posed by such “economistic” activity – what are workers to struggle over, if not the price of their labour-power? – is that of a challenge to the capitalist class and state, as the rulers of that state undoubtedly recognised. I remember my old grandad, who had died 5 or 6 years before, and who had been a railway worker and solid trade unionist and socialist, telling me of the union bully boys and henchmen who used to intimidate union meetings; of how votes by a show of hands would be declared in favour of the militant minority amid the threat of violence. And I remember my brother;s first job with BR, which was so soul destroying because of a culture of waste and of spending for the sake of it. – being sent on jobs one day only to see the work reversed the following day just to maintain the existence of the mini-empires that BR was made of at the time. Thatcherism was a reaction to this sort of destructive behaviour and would not ever have arisen had Barbara Castle’s earlier proposed reforms succeeded. As someone who was an active trade unionist and socialist during this period of workers militancy i can say without hesitation that the the views of Anymaynard above were very much the Daily Mail,Daily Express, tabloid version of events: the vilification of working class grass roots. The idea that Thatcher came in to right the wrongs of working violent class bully boys is laughable for its ignorance. State violence,intimidation and bullying of miners during the great strike was on an industrial scale. Thatcher outlawed the solidarity strike which was at the heart of working class socialism and trade unionism. Thatcherism was part of a capitalist Neo Liberal assault on the living standards of working people and their families to restore profitability and redistribute more power and wealth to the already rich and powerful. Inequality,unemployment and poverty have undermined a confident and assertive working class in the workplace. As for Barbara Castle and her pioneering attempt to introduce state interference to the detriment of the grass root trade unionists in the factories of the time,it was to stop wage drift of workers on the shop floor winning pay rises of one kind or another. It was an attempt which failed to redress the balance of power back to the employers. The social con trick was another attempt by the Labour party /government and the trade union bosses to make the workers pay for the capitalist crisis. The drop in workers standards of living in a situation where the only the workers paid the price of wage restraint or cuts led directly to the winter of discontent. Discontent with Labour and the Tory party’s pro capitalist and anti working class policies. Oh thanks very much. I’ve read the first few lines of your reply only to be told my views are somehow corrupt or dishonest, or have been fed to me by the machine. Fortunately for me my bloodline is as solid working class as you’re likely to find – miners, seafarers, railwaymen; men and women who worked hard, made their own bread and clothes, scrimped and saved, whose arms and backs ached through hard work, and that includes my generation and my kids’. I have the eyewitness accounts of my own relatives to inform me thank you very much not some rag or other. I didn’t feel like reading the rest of your comment after your opening salvo but I did nonetheless and I can’t say I disagree with everything you say, but if you want people to pay attention to what you’re saying then I suggest you avoid the temptation of the cheap and nasty Daily Mail/etc shot and accept that sometimes people can arrive at different conclusions and understanding of events to you and that if they do it doesn’t somehow speak badly of them or how they have arrived there. You are putting words in my mouth. I did not write you were corrupt or dishonest. I could have raised the issue of authenticity because of the rhetoric, but it is probably the way you argue. It is a fact that the Newspaper headlines of the day did portray the very people you describe above as trade union bully boys holding the country to ransom for striking for a better life against trade union bosses,and parliamentary representatives of the rich. It is also a fact that some working class people have not been active trade unionists nor have been on strike and its also a fact that workers are influenced to some extent by the media. Some workers at the time did argue with me that the social contract was fair just like some workers today do believe we are all in it together in terms of the economic crisis. The social facts are we are not all in it together or all pay for the crisis together just like the social contract days. Has state intervention in industrial disputes led to fairness as some workers believe? Instead we have judges bullying strikers into submission and trade union bosses ignoring ballots for strike action or calling of strikes such as the pension dispute rather than fight for their working class members, some of whom work in offices but are still hard working and alienated. Understanding events does not come automatically from simply being a worker. study the history and the politics of the issues and make your points rather than just wave your working class credentials around. In term of debating me that is not going to take you very far because I come from a working class family who worked in cotton mills and engineering factories and left school to work for a living in 1961 or was it 1960. But in any case grass roots opposition to capitalism outlined in the article should be respected and the lessons learned. You said my views were…. “the vilification of working class grass roots”….”laughable for their ignorance”. You speak of members of the working class who might not have been union members; well that group excludes me, my dad, my granddad and my wife, and I felt the need to point that out. I have one real point and no more than that – the views I expressed were my own, borne of direct experience and observation. I think they deserve respect. By the way, I apologise; I had no intention to put words into your mouth. I have treated you with respect. I have taken the time and trouble to reply to your points. But you need to make your points without bringing your Grandad,brother,children, relatives and wife into the debate. Speak for yourself and give examples. Thanks for the apology. You said my views were the tabloid version of events, laughable by its ignorance. Not very respectful – I was speaking for myself, nobody else. You state, correctly that many working class people have no experience of unions and again correctly that many of those people are unduly influenced by a manipulative media, yet when I tell you that myself and most adult members of my family all have or have had direct union experience, you ask me to speak for myself and give examples. It’s ironic that you should suggest that I shouldn’t bring my granddad etc into the debate yet you tell me about your working class family and the cotton mills in which they worked; similarly when you ask me to give examples yet don’t give any yourself. I really don’t feel welcome here. Cheerio. What I said was don’t wave your working class credentials around as if that settled the argument or substituted for argument . My comment about my background was simply to say using your working class family did not give you any privilege in debate. Look you would have had to back up your points- which repeated the tabloid press of the 1960/70s- which you have been unable to do, that the working class militancy was all greedy bully boy tactics which was wrong and should have been regulated by the state. If only Barbara Castle had been able to whip the working class into line. then workers might have behaved. Your views which you say are your families views are deeply conservative and uninformed. Obviously your views are out of place on this site. But if you really wanted to debate and not take the attitude of my family is working class you lot are not then feel welcome to put any points you might have.